Meet Lance Seeto. He has become one of the most influential chefs not just for his food; but for his inspirational lessons of life, humanity and diet he has learned from an ancient civilization. The message he brings back from the descendants of one of the oldest but now extinct human species on the planet is clear – why is humankind so unhappy and sick? What is the meaning of life? And are the foods we eat everyday slowly leading us to a lifetime of disease? From the perspective of an entire native people, when it comes to humanity; Western civilization has got it all wrong. Follow this Australian chef’s four year safari of life and happiness living and working in the exotic tropical islands of Fiji, an ex-British enclave located deep in the South Pacific Ocean. Protected by geographic isolation and their ferocious reputation as the Cannibal Isles, the Melanesian people were left alone and untouched for longer than most native civilizations. Their islands were never conquered; their culture and humanity never uprooted or displaced. Today, Fiji is renowned as one of the most friendliest and safest tourist destinations in the world; where guns are outlawed and the people live with identity, contentment and community spirit. 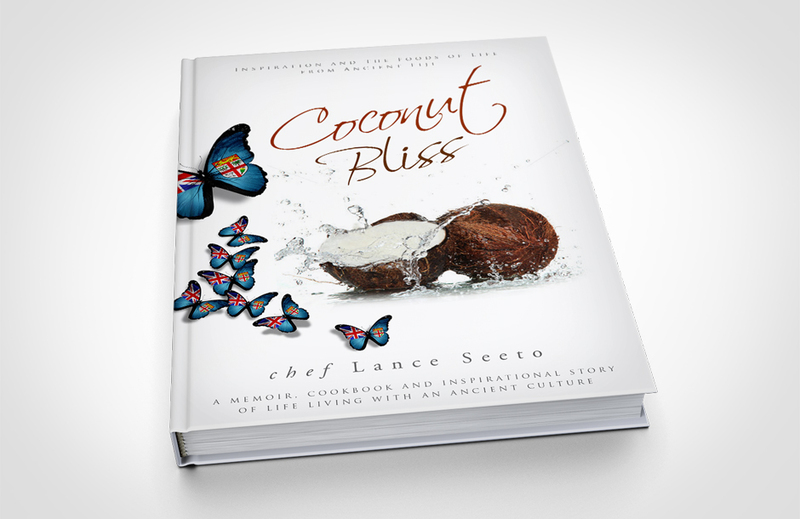 Coconut Bliss is more than just one man’s journey to the edge of the world. It is a story of transformation; cultural contrasts and a clearer understanding of how diet and disease are inextricably linked to the seeds of agriculture and the food we eat. Against the backdrop of one of the world’s most exotic and ancient civilizations, Coconut Bliss shines a magisterial spotlight on humanity and the foods of life. Being disconnected from your world is one of the scariest things to contemplate when taking a vacation. We all expect to find a Wi-Fi hotspot in a hotel room, walking down the street or all around us. We’re uncomfortable when the white noise of television, radio and our phones isn’t constantly clogging our brains with useless information. Castaway Island, Fiji is not where the Tom Hanks’ movie, Cast Away, was filmed but it’s literally across the road on nearby Modriki Island. The local people who have seen the film joke that Hanks’ character stupidly paddled in the wrong direction because the resorts were just around the corner! He could have been sipping cocktails on the beach had he looked over the right horizon. With no television, radio or telephones in the bures, or huts, the international tourist is able to relive the Cast Away lifestyle of unplugging and disconnecting from the world. Nested below a lush rainforest mountain and surrounded by an aqua blue sea, Castaway Island’s resort is one of the oldest and most famous holiday destinations in the region. It has had nearly fifty years to perfect an experience of serenity, contentment and tropical lifestyle that is distinctly Fijian in culture. I was keen to get started and wanted to do as much research as possible on the local produce and cuisine. I had read a lot about the fresh wild seafood, coconuts and sweet tropical fruits, so I was excited to get stuck into my first Fijian meal. With such an abundance of locally grown, exotic tropical fruits, organic vegetables and the most pristine wild seafood of anywhere in the world, traditional Fijian food was sure to be amazing. My first dining experience was the Fijian lovo, a traditional feast of roasted meats, fish and root vegetables slow-cooked in an earth oven. Similar to the Hawaiian luau or Maori hangi, uncooked food is wrapped in native leaves and then buried in the ground for at least three hours. The result is a smoky, wood-flavor that permeates the food. As much I as wanted to enjoy my first Fijian meal, I found it bland with no depth of flavor, no complexity and no hint of native creativity—there definitely wasn’t any seasoning! Everything taste like it was thrown into the pit without thought to flavors and timing. With plenty of room for desserts, I wanted to try all the different coconut-based delights the Fijian chefs told me were traditional recipes. To my pleasant surprise I loved most of these! Cassava (tapioca root) and plantain bananas cooked in freshly grated and squeezed coconut milk was exactly what I was expecting in a native cuisine. The pineapple pie and teacakes though, reminded me of something out of a Girl Guides cookbook from last century. I was later to discover that there was indeed such a publication produced by the local white homemakers some decades earlier, as a means of teaching both the settlers and natives the delights of British colonial home cooking! My continued experiences with the food around the islands’ resorts and restaurants resembled the tourist fare of Waikiki, Hawai’i some twenty-five years ago; tasteless, boring and overcooked. What was going on here? With Australian culinary textbooks; a government-run culinary training college; and a young but established tourist industry; why was the food so crappy? The answer was to be found in Fiji’s past. Every country’s local cuisine can be defined by the fusion of the food from its diverse culture and the influence of other nations upon the indigenous cuisine. But in Fiji, its history and culinary development has been very different. Fiji was never conquered or had its native culture displaced by the colonising empires of the Dutch, Spanish, Portuguese, French, German, Japanese, Americans or even the English. Its isolation from the major spice trading routes; its fierce reputation as the Cannibal Isles; and its unmapped and deadly reefs kept many of the conquering empires away from Fiji until well into the seventeenth & eighteenth centuries. In comparison to other parts of the world, pre-contact Fiji was a divided nation of clans fighting and conquering each other whilst the ancient kingdoms of the old world were forcing their cooks to come up with something different every day to satisfy the desires of their rulers. Threatened with death, those cooks ventured far across the land to find new herbs and spices, plants, nuts, animals and sea life to include in their kitchens. In Fiji, despite a diverse mix of Melanesian, Polynesian, Micronesian, Indian, Chinese and European cultures, there has been very little reason or motivation to experiment with different techniques and flavours until very recently. As I enjoyed more staff meals of local recipes in my kitchen, I realized Fijians do not eat or see food in the same way. The Western concept of meat and three vegetables does not exist, and a rare or blue steak is completely alien. Their proteins have always been slow-cooked, well done, whether in the earth oven, smoked over an open fire, fried or stewed. And cooking times, presentation, textures and flavors are not always paid much attention, especially if there is a rugby union game or kava session in progress. The huge celebratory feasts are a mass cook-up of unmodified, wild starches like taro, cassava, sweet potato and breadfruit, with pigs and chickens thrown into the fire with no seasoning or marinades. I wondered why the traditional foods are hardly seasoned until I sat down to my first Fijian meal to discover bowls of salt, lemon and chilies across the table. Fijians add the seasoning after cooking, sometimes drowning the food in excess iodized salt and lemon, whilst intermittently biting the baby chilies in between mouthfuls of food. With fish and native greens, bowls of freshly squeezed coconut milk mixed with onions, tomato, lemon and chilies accompany seafood called a miti. Whilst certainly tasty, the young cook is challenged to develop a more refined palate and understanding of portions and presentation when they go into the real world of resort kitchens – and very fussy and temperamental tourists to satisfy. This presented a new set of challenges in trying to teach a local workforce to cook like my Australian apprentices and chefs. How do I gain the quick respect of a local workforce? I’d have to delve much deeper into their heritage. To read the Luxe Beat Magazine version of this article click on the title Book Excerpt Coconut Bliss. Australian Lance Seeto is an award-winning international food & travel writer, author, television presenter and life food chef, based on Castaway Island, Fiji, in the South Pacific. He is credited by the Tourism Fiji board for single-handedly igniting a culinary revolution in the country and has been integral in getting its people, restaurants and tourism resorts to think differently about food and to embrace their culture through tropical island cuisine. Having left Australia in 2009 in search of new horizons, he has stumbled upon a different perspective of life through the Fijian people, and in the process discovered his own purpose, meaning and a renewed sense of contentment and happiness.